Over 40 teachers from 13 rural Oregon school districts have been learning about bioenergy and are prepared to take their new knowledge back to the classroom. The teachers, many of whom were unfamiliar with bioenergy, have not only learned the basics of bioenergy but now have in hand 20 bioenergy lessons ready to use with their K12 students. This is the second year that K12 teachers in Oregon have participated in a three-day workshop focused on bioenergy education. The K12 bioenergy education program, a partnership between Advanced Hardwood Biofuels Northwest (AHB) and Oregon State University’s (OSU) Science and Math Investigative Learning Experiences (SMILE) program, focuses on schools in rural communities where the production of biofuel feedstocks such as hybrid poplar will take place. SMILE teachers enjoy a bioenergy activity during the 2013 August teacher workshop. When the partnership between AHB and SMILE was first established, the bioenergy curriculum focused solely on training high school teachers. However, positive feedback made it clear that elementary and middle school teachers were very interested in bioenergy lessons as well. At the 2013 August workshop, SMILE expanded the curriculum to include a bioenergy track for students in the 4th grade through high school. Pat Whetstone, a SMILE middle school teacher from Siletz Valley Charter School in Siletz, OR, works on integrating bioenergy concepts into curriculum during the August 2013 teacher workshop. 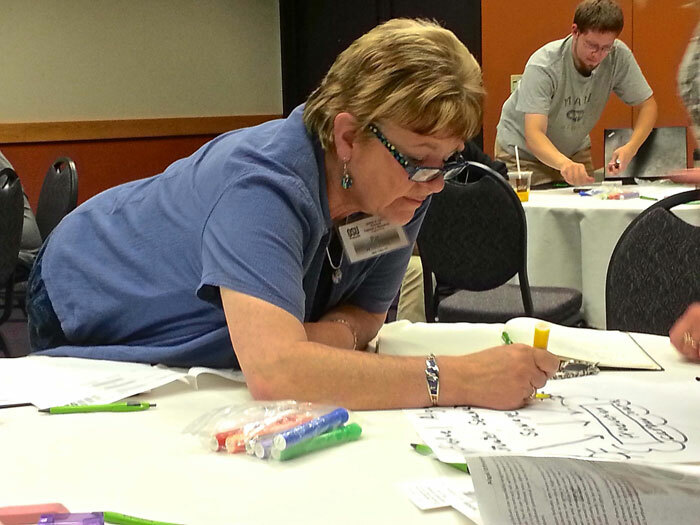 During the August workshop, teachers engaged in hands-on learning activities they can use to introduce bioenergy concepts to their students in rural Oregon. Through these lessons, younger students will have the opportunity to investigate how different energy sources may be used to produce ethanol and other biofuels. For example, in a simple experiment designed for 4th and 5th graders, students observe the fermentation process of different types of simple sugars present in corn syrup, white table sugar, honey, and milk. High school teachers learned about the function of cellulose so they can demonstrate to their students how biofuels are produced from non-food sources such as wheat straw, corn stover, and hybrid poplar. SMILE is currently preparing a new set of lessons on growing feedstocks for bioenergy for a winter 2014 teacher workshop. Working with AHB partner, GreenWood Resources, Inc., high school and middle school teachers will be provided a number of different varieties of poplar cuttings for students to plant in early spring at their schools. The teachers will work with students to track the growth of the poplar trees over the next year. Students will take a variety of measurements on the trees and also record temperature and precipitation. They will then input the data into a centralized website, allowing participating schools from around Oregon to compare the growth of their poplar trees. By analyzing the data they collect, students can begin to assess which poplar varieties would make the best feedstock in their community, and observe how variation in climate and growing conditions effects poplar growth. SMILE educators will incorporate teacher feedback into the bioenergy lessons so they can be easily applied in science classrooms throughout the Pacific Northwest (PNW). Once the curriculum is finalized in early 2014, teachers throughout the PNW can download the bioenergy lesson plans from the AHB website (hardwoodbiofuels.org/resources/education-resources) to use in their classrooms.